Connect Fruit, instead of dots. Take turns matching six attractive fruit patterns. 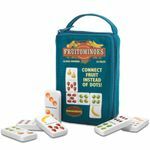 A fresh, fruity and colorful twist to the classic game of dominoes. Includes twenty-eight crafted dominoes in a compact pouch.